Atomic Green Lantern is haunted by the fiery destruction of civilisation. I watched that Saoirse Ronan film about nuclear war last night, so I know how he feels. But where I fight on to bring games news and trailers to youse lot, the emerald superhero lives his final days to restore hope to Earth. He does this in esoteric fashion – by fighting in competitive bouts of laned combat. 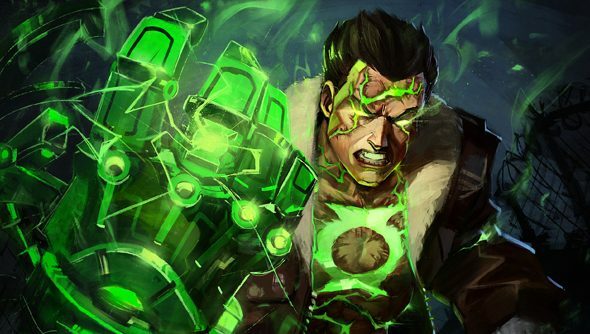 Scientists estimate that there are at least eight billion forgettably named Green Lanterns in the DC Universe, but Turbine have plumped for the best-known for inclusion in their MOBA: Hal Jordan. We pick back up with Jordan after a post-nuclear accident leaves a radioactive isotope buried in his chest, his right arm replaced by a construct borne of his own will. His life expectancy has a half-life, and he’s in constant pain. He’s going through a bad time. But he is able to melt enemies with radiation. Here’s everything we know about Infinite Crisis – the closed beta for which begins October 28. It’s certainly intriguing to see the talent behind Lord of the Rings Online turned to Dota-like ends, wouldn’t you say?